Last week, we told you about how cleverly placed graphics can seal your business proposal’s deal. Today, we are going to tell you how to pair those images with appropriate action captions for a proposal that doubly wows. The smart use of action captions in your proposals is a great way to keep your readers interested and thinking about how whatever you’re proposing can benefit them. But your proposal will suffer if you fail to put some thought into how action captions work within it. Action captions, as the name suggests, are designed to urge customers to actionable outcomes. In practice, this means successfully offering your reader a message of value that’s condensed into the relative confines of an image and its caption. Done right, action captions are highly effective. The correct use of creative action captions can unlock previously untapped potential within your proposals. Let’s take a look at how action captions can be put to work for your business. Unless your work is entirely visual, your proposals shouldn’t to be peppered with a slew of images and captions. If you try to put too many into your proposal, the important actionable outcome you need from the proposal itself may become secondary to the various actions described in all the captions. Action captions should be used to emphasize key benefits, features, or other actions that are, first and foremost, of value to your audience. Beyond that broad criterion, here are a few other prerequisites for the use of action captions. Add captions to all the images in your proposal, other than logos. Captions need three things: the name or number of the figure it refers to, a title, and an interpretive caption. The title should be clear and specific. The caption should be focused on a tangible benefit to your customer. Use a smaller font or italics to distinguish the text of the caption from the body of the proposal. All of these parts should come together in a caption to make it clear to your reader why you have opted to add the respective image. In the slightly tongue-in-cheek example to the right, the action is very clear: Beware of bears. To repeat an important point: whenever you choose to employ an image in your proposal, it should be accompanied by an action caption. 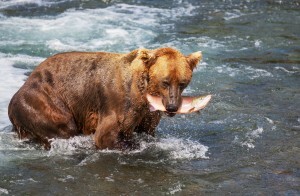 The ideal action caption should be just as clear as our grizzly bear example. 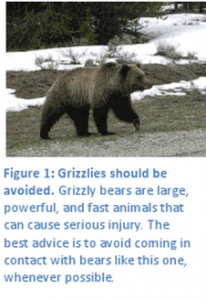 Note that every aspect of this action caption hinges on the implicit benefit — not being mauled by a bear — leading to the desired action — avoiding grizzlies. This bearable logic can be applied to the actionable outcomes you’d like your readers to take. Since people are drawn toward images more than they are attracted to the idea of reading text, action captions should act as bridges to the written portion of your proposal. The text itself should reference the figure number of each image. Remember how we discussed not overloading your proposal with images and corresponding captions? Use the action caption bridge to make sure that those things come together as a cohesive whole, inside your proposal. Grand Teton Park is home to a wide variety of wildlife species, including large predators. Grizzly bears (Fig. 1) are found throughout the park, and should be treated with extreme caution. Note that the example avoids redundancy by allowing the image and action caption to present new information. The idea is beary simple, but solid, and it’s something you’ll want to consider in drafting your own action captions – avoid repetitive information. Emphasizing benefit to your customer is the main objective for creating action captions. The best way you can do that is to seize the opportunity to quantify as often as possible. Example 1: Our Shiny, Anti-Grizzly Hats will scare off more bears and save more lives! Example 2: Park rangers who wear our Shiny, Anti-Grizzly Hats have seen a 26-percent decrease in close-range bear sightings. Why is the second example better than the first? Well, yes, the first sounds absurd, but, also, Example 2 gives us statistics — and people love to rely on numbers. Quantifying the benefit of a given action is not unlike outlining a value proposition. A quantified action caption is specific, measurable, timed, and result-oriented — just like a value proposition. Adding quantification enhances reader perception and increases credibility. The statements you use to quantify a benefit need to be well supported within the text of your proposal, of course. As you begin to use action captions in your proposals, remember that readers are acclimated to the presentation of action captions in the way that we’ve discussed. So making consistent action captions is a great way to underscore the professionalism of your proposals. Just remember, an action caption needs to focus on a tangible benefit for your customer. All images and action captions should be used to further the message of your proposal and to help ensure the actionable outcomes you so desire. By carefully writing action captions, you’re sure to up the effectiveness of your proposal. How do you make action captions work for your proposals?